As I have finally gotten into the groove of the senior websites, I find that there is only so much I can participate without members asking me more personal information. While I had some failures in chat rooms, I found more of an interest in the forums and what they provide for the senior citizens. In the beginning of the practicum, I was frustrated because nobody would acknowledge me if I said I was 21. As I felt it was unethical to lie about my age, I struggled to find ways to participate rather than just observe. When I came across the variety of forums including Boomer Women, Yahoo! Senior Forum, and Senior Citizen Website, I found that there is more of a sense of loyalty between the members. Ranging from subjects on Mental Illness, Empty Nesting, Divorce, Death, the forum allows members and anonymous strangers to post their feelings and receive a great variety of feedback. I have participated in many sites as both a member, and anonymous, and have found that you receive more feedback if you are a member, which gives you an “authentic” identity. I put authentic in quotations because the Internet rarely guarantee someones true identity, as I never divulged my true information. However, senior citizens are willing to give their advice and experience through people they feel truly connected to.At times I felt bad, because I didn’t want to think I was taking advantage of these people. I felt I was imposing because I was recording information for research, and people on these websites share deep emotions within themselves. Still, I tried to be as respectful as possible and share any information I could without giving up my age. I think it is interesting that as the project is coming to a close, I will disappear from these websites as if these conversations never existed. It must happen frequently, as there is a great emphasis on the members who have been there the longest, and have posted the most. Naturally, however, people come and go from these websites through time. I could see myself maybe at some point in my life participating in an online community, if I were ever to feel that I had no one else to talk to. While I hope that doesn’t happen, it is comforting to know that there is a forum out there where people will help, even if they don’t know your name. “Flame Wars” now on Wiki! Since I have learned all sorts of lingo from my experiences on senior citizen chat rooms and forums, I decided it was time to add my input on the Wikipedia site! 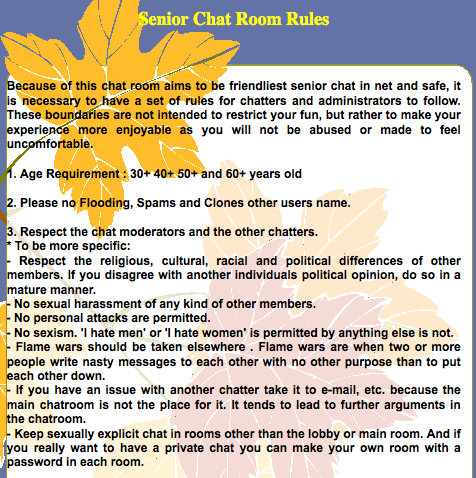 I went to the subject: chat rooms and realized that in the rules section the term “flame wars” wasn’t there. This is a term that is used on multiple web sites “chat rules” sections and is used to describe when a person says hurtful things to someone with no other reason but to hurt their feelings. I think this is an important term to know because many people will break this rule when they participate in a website. I think flame wars are a type of bullying and it makes me feel better to know that it is being regulated on all of these sites. I think chat-rooms should be a place where people feel comfortable to be themselves and not get their feelings hurt for no reason.